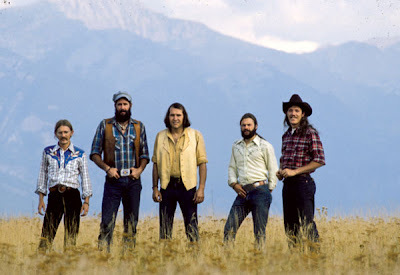 There are a surprising number of Montana musicians and bands that have made their mark on the state over the years ... but if you're a Montanan of a certain age it's almost guaranteed that a group called the Mission Mountain Wood Band holds a special place in your heart. I happen to be of that certain age, and so you'll likely be seeing more about M2WB here before too long. The band was at their peak back in the late 70s and early 80s, touring nearly constantly. One of their regular stops was a place up in Gallatin Canyon called "Buck's T4"; Mission Mountain was booked at the place every New Year's Eve for a dozen years. Then the band started to break up, and there was a plane crash, and except for a couple of glorious reunion concerts Mission Mountain slowly started being forgotten. But this year, for whatever reason, the surviving members of Mission Mountain decided to get back together, and they're touring again. And tonight they'll be playing New Year's Eve at Bucks, for the first time in 24 years. The show's been sold out for weeks, and it promises to be a blast. The 70s aren't dead yet! Here's a photo of a town you've probably never heard of ... and one that really doesn't exist anymore. 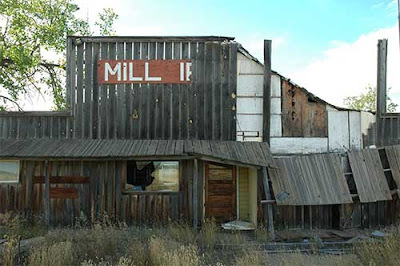 Mill Iron, Montana was in far northeastern Carter County, out in the middle of some surprisingly lovely countryside. The post office there was established back in 1916 at the height of the eastern Montana homestead boom, the site named in honor of a large Texas cattle ranch. Mill Iron probably never had much more than a post office, store, and school, and this old roadhouse was about the last of the place. I imagine it closed about the time the post office was discontinued in 1990. When I went through there about four years ago, most of the equipment for a little cafe was still inside ... waiting for the revival that will never come. I remember being introduced to the work of James Welch back in the 1980s, and being struck by the power and (especially) the bleakness of his writing. Welch was a Native American from up on the Hi-Line, and another product of the great creative writing program at the University of Montana. His novels are despairing things, capturing the desolation and hopelessness of Montana reservation life with a poignancy that other authors have largely been unable to match. your hate for the wild who bring you money. help us, oh God, we're rich. The more time I spend wandering the Internet, the more I realize that somebody's already created at least one website for pretty much every single topic known to man. 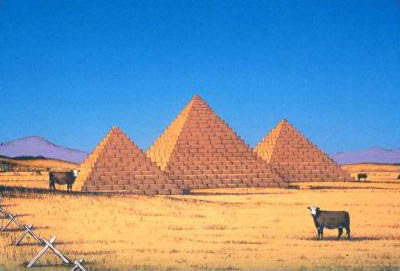 This morning, for example, I stumbled across a site titled, "Hay in Art: A Collection of Great Works of Hay." It's a database of close to 6800 paintings, photos, essays, and poems on the subject of hay ... including no fewer than 177 entries from the state of Montana. At the head of the Montana list was this 1987 lithograph by Missoula artist Monte Dolack titled, "Points of Interest." Dolack is one of Montana's best-known contemporary artists ... his work is clever and whimsical, and for decades now it's single-handedly kept a big chunk of the state's notecard and poster industry afloat. I enjoy much of it, though it's definitely become a stereotype, and it's important to remember that Montana's art community is far more diverse than that. When you take a lot of photos, you keep some because you like their aesthetics, and you keep some for sentimental reasons. This year's last holiday-season photo is one that falls in the latter category. I don't know if they still do it now, but for many years a number of the national park lodges had a tradition of celebrating Christmas in the summertime ... the rationale being that since the hotels were closed in the winter, a December 25th celebration was pretty much out of the question. So back when I worked at Glacier, we celebrated Christmas every July 25th. There was a big employee dinner, and caroling, and gifts, and of course a tree. 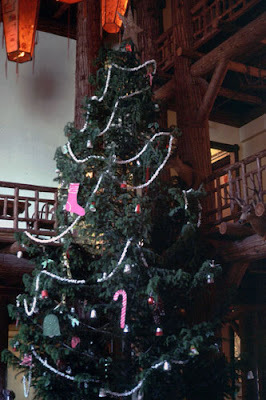 This is the Christmas tree that graced the lobby of Lake McDonald Lodge back in July of 1981. A few days earlier, the hotel bellmen had piled into their rattletrap old stake truck and made a surreptitious run out to the National Forest for it ... and then we all put the thing up and piled on the homemade decorations. One of my favorite trees ever. As pretty much every Montanan who's ever gotten a Christmas card knows, the artist Charlie Russell did a number of Christmas-themed paintings over the years ... scenes that reveal Russell's strong sense of the Montana landscape, as well as his characteristic sense of humor. 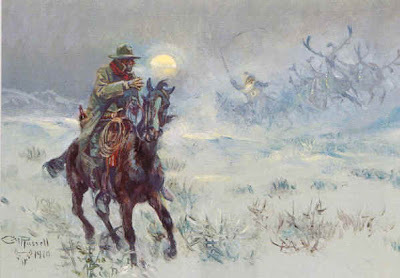 Here's a painting he did back in 1910, called "Seein' Santa." A very happy holidays to you all. Today's photo is another one that that I took last week ... this old farmhouse is a few miles north of Avon. It seems to reflect the season a little bit. One of the rituals of America's holiday season is the annual installation of an always-perfect Christmas tree at the U.S. Capitol building in Washington. Since the 1970s, the tree selection process has taken on a life of its own, with states vying for the honor of supplying the tree. It's usually good for a few newspaper articles, though I tend to think the trees involved always look better standing in the forest, alive. Montana has supplied the Capitol's Christmas tree twice, most recently in 2008. The other time was in 1989, when Montana used its statehood centennial as a hook to win the Christmas tree honor. That June, a federal landscape architect headed out to the Kootenai National Forest and selected a handsome spruce tree outside of Libby -- a town whose heritage is inexorably tied to logging. In conjunction with local volunteers, the Forest Service scheduled the tree-chopping for mid-November, a public event with lots of press coverage. Libby, Mont. (AP) -- Residents watching the cutting of a 90-foot spruce selected as the U.S. Capitol's Christmas tree went scurrying for cover when the falling tree twisted out of control and crashed across a road. The Giant spruce toppled onto a crane mounted on a logging truck waiting to haul it away. Ten feet broke off the top when volunteers tried to move it at the Kootenai National Forest in northwestern Montana. U.S. Forest Service spokesman Jeannie Spooner said guy wires were attached to the first tree to lower it, but the tension on the wires apparently wasn't even. Today's photo is one that's always seemed kind of festive and holiday-like to me, even though that really isn't the subject matter at all. These are the lights in the lobby of Lake McDonald Lodge in Glacier Park ... a shot I took back in May 2005, right after the hotel had opened for the season. Well, we've finally reached the day that I look forward to the most each year: the Winter Solstice. After today, Montana's tragically short winter days will start getting longer again, and our insanely long winter nights will start getting shorter. Now there's nowhere to go but up ... at least for the next six months. 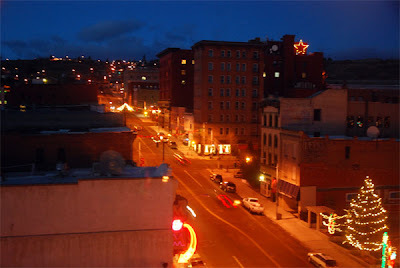 In honor of that, and of the upcoming holiday, here's a nighttime shot I took in uptown Butte a little over two years ago. I don't know the exact time of this photograph, but it was well before the dinner hour. The Roman Catholics had raised a large sum of money the previous year by holding a Christmas bazaar, and our ladies decided to have a similar bazaar [to raise money for a church building]. They came to me full of the idea and enthusiasm. I approved cordially, but they innocently added, "And we will have dancing and raffling, and we will make lots of money for our church." "What!" I said. "Have a dance and raffling for a Presbyterian Church?" "Why, certainly, they replied. "The Roman Catholics made most of their money that way last winter." I promptly said, "That cannot be." They insisted, and at last I said, "I have a valise; it is readily packed. I will not remain in charge of a Helena church if such a bazaar is undertaken." The following Sunday night in the Odd Fellows' Hall (where we were meeting temporarily), I faced a house full of me. . . . I knew that Christmas had been a day of dissipation for many of them. I knew that the coming New Year's Day would be even more so -- as the custom of our leading families was to keep open-house on that day, and to offer refreshments, including liquor, to their guests. With a purpose, my text that night was, "Look Not Upon the Wine When It Is Red." . . . 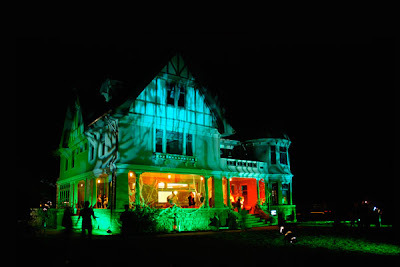 The next morning, as I walked up Main Street, I was conscious of an atmosphere. Some men would not speak to me; some acted as if their necks had been stiffened. On entering the store of one of my congregation, he shook a warning finger and bade me to look out for myself. I asked why. He replied, "Because of your temperence sermon last night!" I had suddenly become famous, or rather infamous. The idea of preaching a temperance sermon in Helena -- and such a sermon! I had quoted a remark of a friend, "All Helena's Drunk on Christmas Day," in the sermon. This was taken up on the street with a vengence. The celebration of Christmas commenced here on Christmas Eve. As early as seven o'clock we saw devotees of Bacchus reclining in positions more compact than graceful, on several of the steps that obstruct our sidewalks. The liquor, billiard, gambling, and concert saloons and hurdy-gurdy houses were filled, and they remained so for two days. At some point, nearly every saloon had its own peculiar row. Any looker-on, bearing in mind the danger from stray shots, would make up his mind (as did the son of the quarreling family) that they "had a little hell of their own, and devils enough to tend it." Main Street was the broad aisle through which the devotees of pleasure marched to do their idol homage. As they did so, their barbaric yells resounded throughout the town. They yelled just for the sake of yelling, as some babies do. On Christmas night the orgies reached their height, but we can give no detailed description of them for most of the participants had become so drunk as to cease to be amusing. The hurdy-gurdy house on the corner of West Main and Bridge Streets was so crowded that the heads were as close together as pacing stones. At last commotion was here created among the carousers by the firing of fire-crackers surreptitiously tossed under their feet. . . .
At the Police Court there was disappointment. The harvest seemed ripe for the reaping, but it was not brought in. Thus the Justices had to pass a gloomy Christmas with only one poor little victim to console them. I got to drive up to one of my very favorite places in the state yesterday -- the Nevada Valley, up in northern Powell County along the Big Blackfoot River. The setting is gorgeous, and man's impact on the land is still subtle and appropriate. Big cattle ranches, free-flowing streams, and the two great little towns of Helmville and Ovando. 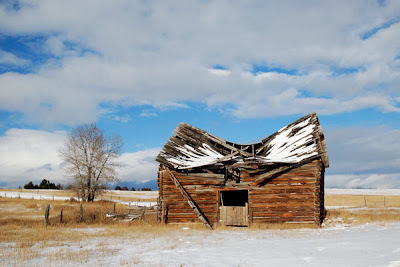 This was my destination -- an old barn that needed to be researched and photographed. It's a few miles northwest of Helmville, in an area the was mostly settled by Irish immigrants in the late nineteenth century. The barn was built by a man named Matt Little, who started a ranch in the valley back in 1899, and stayed for close to fifty years. It's all that's left of his place today ... except of course for the land itself. Montana's Native American tribes -- some of them, at least -- received a fair amount of photographic attention in the early 20th century, as people realized that Indians' traditional way of life was beginning to disappear forever. Perhaps because of their historic association with the Custer battle, period images of the Crow tribe are particularly well-known, and some of them are among my favorites. 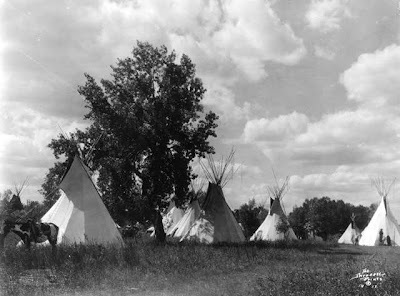 Here's a great shot from 1917 titled, "The Summer Camp." It was taken by a man named Richard A. Throssel, who had moved to the reservation in 1902 and extensively photographed the Crow and their culture. He had been made an honorary member of the tribe in 1905, receiving the Crow name, Esh Quon Dupahs, which means "Kills Inside the Camp." I took this photo a couple of years ago, a little west of Three Forks on old US 10. 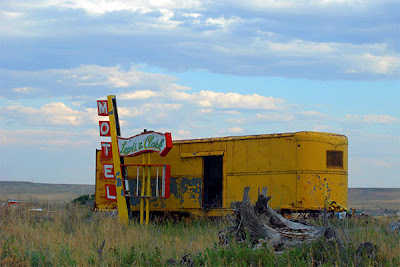 The motel is still in Three Forks, and it seems like I can actually remember that great old sign guarding it, back in the day. Just a quick photo this morning ... a late-afternoon shot I took a few weeks ago along the Yellowstone River, out in Treasure County. Who says eastern Montana is flat and boring? I've mentioned the WPA's fine Montana guidebook here before, but that was only one of many literary and artistic efforts the agency undertook here during the Depression years. 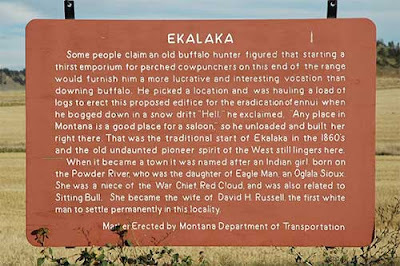 One relatively little-known project involved collecting Montana "folklore" ... anecdotes about the state's past obtained through both an oral history program and a review of published sources. A vast amount of material was gathered, and it's now archived at MSU. On November 21st, 1889, one of Butte's judges received the surprise of his life when John Dough walked into police court and nonchalantly and soberly informed his honor that he intended to get drunk and disorderly. He said he was determined to become inebriated for a day and desired to have his trial pronto and pay whatever fines the judge wished to impose. The charges amounted to eleven dollars, one dollar, and costs, which Mr. Dough willingly paid. Upon being paid the judge told the man he could go and perform as he intended. "Thanks, Judge," replied the potential celebrant. "Does that mean biling drunk?" "Yes, drunk as a boiled owl." "Does it include disorderly conduct?" "Thanks," he said and walked out. There are an awful lot of books about Montana being published nowadays ... and as always, Glacier Park is a favorite topic. The park is getting more literary attention than ever thanks to its upcoming centennial, and the results are typically mixed: some are quick and shallow coffee-table exercises designed to turn a buck, and others are wonderful labors of love. Last week, I received my copy of a new book that definitely falls into the latter category, and though there's a bit of self-promotion involved I wanted to mention it here. 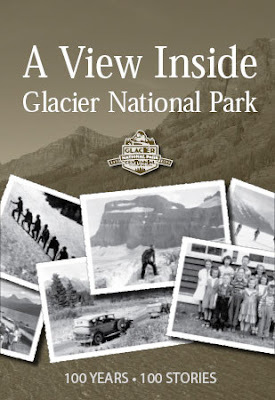 The volume is titled, A View Inside Glacier National Park: 100 Years, 100 Stories, and it's an anthology of personal reminiscences of Glacier, compiled in honor of the centennial. The list of contributors reads almost like a Glacier Who's Who, and if you've been around the park for a while you'll likely recognize a good many of the names. A number of the individual stories are really wonderful, and the entire book is a great read. Collectively, the essays are able to convey what makes Glacier such a special place to so many people ... and that's something that no other book I've seen is quite able to do. The book is available from the Glacier Association ... and as for the self-promotion part, I'll confess to being one of the story contributors. But you should buy it for the other 99 stories. I take thousands of photos that I don't think turn out quite right, of course, and you generally won't see those here. The shot below is one that's in my "not quite" category ... but the old building is cool enough that I thought I'd post it anyway. I still need to go back and reshoot this someday, though. 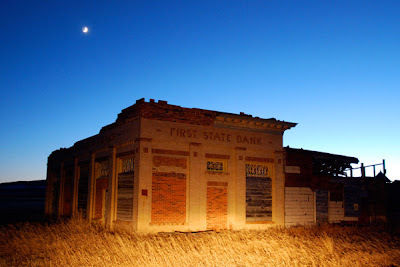 This is the bank building in Buffalo, Montana, illuminated by my car's headlights. Buffalo is a very cool little place, an almost-ghost town with an evocative setting and several great old buildings. It'll be near the top of my destination list when the weather starts to warm up again. Those of you who know me in person know that I'm inclined to complain every once in a while ... and well, I want to air a complaint today. 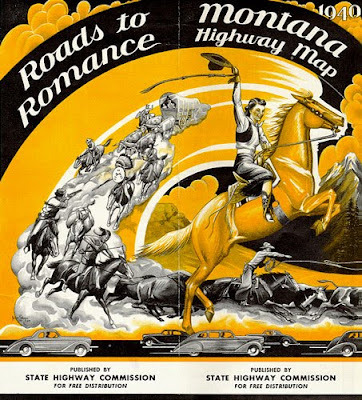 My post about The Big Sky mentioned Montana's long history of tourism promotion slogans, and I confess I'm perfectly happy with some of the old ones -- "Land of Shining Mountains," for example, is pretty hard to beat. Nonetheless, the state tourism folks somehow feel the need to invent new slogans every once in a while. The current one being hyped by Travel Montana is "There's Nothing There," which has apparently been getting good reviews from advertising guys ... though it just makes my eyes roll. 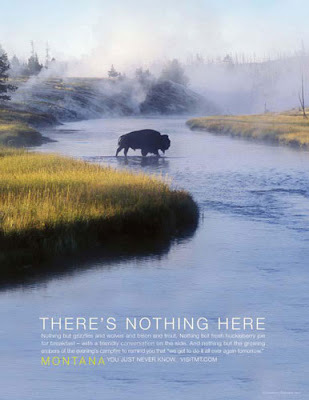 The thing that I really want to complain about, though, is this: a big chunk of the current Montana ad campaign focuses on Yellowstone, as in the sample below. Travel Montana has been doing this for years, blithely ignoring the fact that the Yellowstone photos they use are all shot in Wyoming! In fact, roughly 96 percent of the park is in Wyoming ... making ads like this seem pretty disingenuous at best. It's embarrassing for the state, I think, and if I were a Wyomingite I'd be a little ticked off. Besides, we don't need Yellowstone! The real Montana is way cooler, anyway. 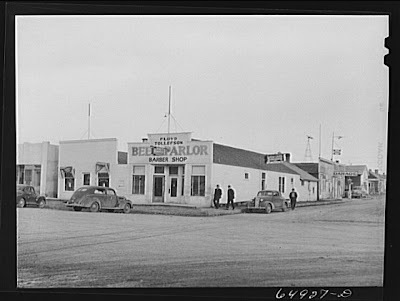 It's always fun to look at historic photos and compare them with the way things are today ... and one of the cool things about Montana is that a lot of the times the comparisons are pretty strong. We're a land of timeless landscapes. That's not true, of course, for many of the towns in the western third of the state, which have long since been "discovered" and thoroughly transformed by an influx of people. And there's no better example of that than the town of Bigfork, up on the northeast shore of Flathead Lake. 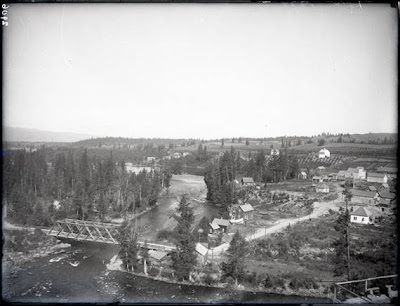 Here's a photo of Bigfork taken by Morton Elrod back in 1908, and now in the University of Montana archives. As best I can tell, we're on the hill just south of town, looking north ... but except for the Swan River, you'd be hard-pressed to find anything at all in that shot that's recognizable today. And that's too bad. Strangely enough, Montanans have a strong sense of belonging -- a sense which grows, perhaps, out of their common necessities. They live, after all, in a place where nature can turn a face of cold inhospitality upon them in an hour's time. Without kindness, friendship, and co-operation they could not stand up in the face of it. And perhaps Montanans feel that they belong, too, because of the kindredship of the old and the new. All around them are the old sights, old sounds, and old smells of the land itself. 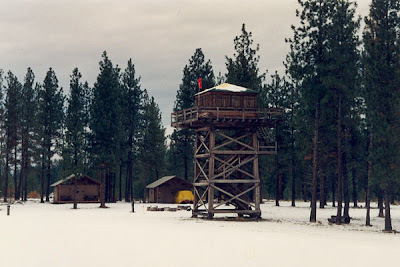 This is a shot I took way back in 1994, of what looks like an old Forest Service fire lookout tower now surrounded by trees. But it's actually a movie prop -- it was constructed in 1989 at the municipal airport up in Libby, to serve as a mock control tower during the filming of the movie Always. John Goodman had some of his best scenes up in that thing. Always is the story of a pilot for the Forest Service, who flew tanker planes filled with water to fight forest fires. He's killed in a crash during one of the film's first scenes, and Audrey Hepburn brings him back to earth as an unwilling ghost who needs to do a good deed or two. It's an unquestionably sappy film, but I still like it, and it's got some nice northwestern Montana scenes ... along with my very favorite rendition of the song, "Smoke Gets In Your Eyes." As for the control tower, they had to move it a bit after the filming so it wouldn't interfere with airport activities, but as of a few years ago at least it was still up there ... one of the few physical reminders of Montana's long connection with Hollywood. Today's photo is another shot taken by Harold Booth back in 1934, and forwarded to me by Derek and Ann Legg. 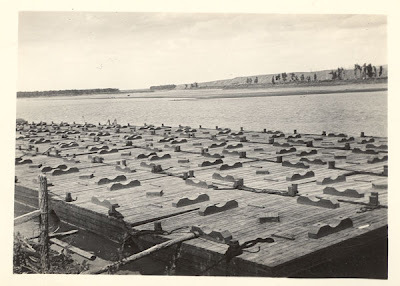 The handwritten note on the back of the photo reads, "Pipe line Barge, Ft. Peck, Mont."... and that's all I know about the image. You can easily see the pipe brackets, though, and clearly someone had an awful lot of it that they needed to haul up the river somewhere. 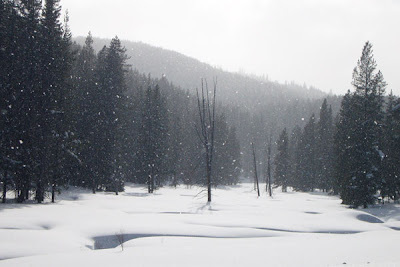 Here in southwestern Montana, we're in the middle of our first really cold winter weekend, with new snow in the valleys and the wind chills well below zero. So like it or not, I suppose it's time to pull out another wintery photograph. I took this shot early last April ... we're looking up towards the headwaters of Joseph Creek, just east of Lost Trail Pass in Beaverhead County. Back in the summer of 1901, a man named Alfred Guthrie moved his family to Montana so he could take a job as a high school principal. On his first day in the state, he was reported to have exclaimed, "standing under the big sky I feel free." As you've probably guessed by now, that man was the father of the famous western novelist A.B. Guthrie, Jr. In 1947, the younger Guthrie had just finished his first book, and was struggling to come up with a title ... he showed a number of family documents to his editor, who discovered the quote above and knew he had a winner. It wasn't long after The Big Sky was published that Montana's tourism people figured that they had a winner there, too ... and the phrase has been strongly associated with the state for over half a century now. I've always liked the slogan, though I confess I like it a little less now that the name has been appropriated by a destination resort catering to wealthy out-of-staters. But so it goes. Here's a paragraph from the original novel, an evocative description of the sense of place that many of us feel about Montana. Boone lay on his back and looked at a night sky shot with stars. 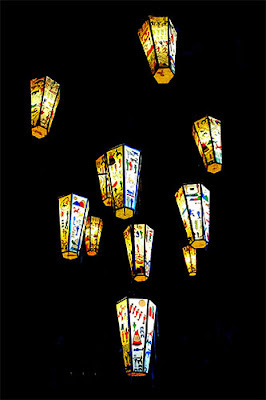 They were sharp and bright as fresh-struck flames, like campfires that a traveler might sight on a far shore. Starlight was nearly as good as moonlight here on the upper river where blue days faded off into nights deeper than a man could believe. By day Boone could get himself on a hill and see forever, until the sky came down and shut off his eye. There was the sky above, blue as paint, and the brown earth rolling underneath, and himself between them with a free, wild feeling in his chest, as if they were the ceiling and floor of a home that was all his own. 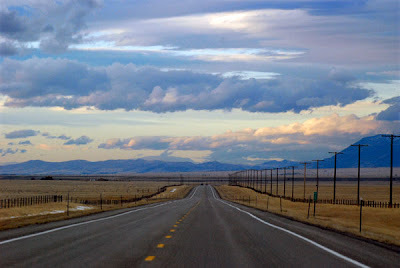 Depending on how you count, I suppose, there are basically four main east-west highways crossing Montana: US 2, US 12, Montana 200, and the Interstate. My least favorite of those, by far, is the freeway ... the road is a scar on the land, and when you drive on an Interstate you miss the little towns and all the other cool sights that make a roadtrip interesting and fun. All the two-lane roads are great journeys, though US 2 is probably a little less rewarding for me than the others. For a drive that shows the vastness and emptiness and wide-ranging beauty of Montana, Highway 200 is hard to beat. 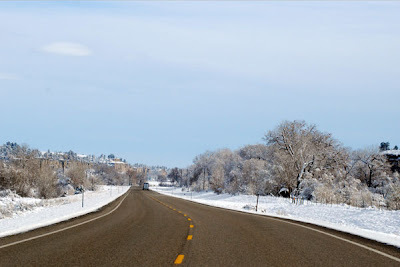 I'm a particular fan, though, of US 12, which has a great mix of mountains and prairies and Badlands country, along with some of my favorite small towns. The road follows the Musselshell River for 140 miles or so, a valley that's unremarked but surprisingly lovely. Today's quote is an excerpt from a story called, “Grandfather and the Popping Machine,” written by a Northern Cheyenne named Henry Tall Bull. It describes the day, decades ago, that his grandfather purchased his first automobile. I found this quote in the Montana history textbook currently used in many of the state's schools ... it's a little long, but it's a great read. My grandfather, old man Raven, was one of the first Cheyennes to buy a car. He called it a popping machine because of the pop-pop-pop noise the engine made. Grandfather had always been good at handling horses, but learning to drive a car was something different. This was an adventure! Grandfather bought his popping machine in Forsyth. The salesman at the garage cranked the engine for us. Bang! Boom! Bang! Pop-pop-pop! The car shook and the noise was awful. Grandfather held tightly to the steering wheel. Grandfather nodded. “Like horse, only kick at other end,” he said in his broken English . . . Grandfather did what the salesman told him to do. Maybe his foot slipped off the clutch pedal, or maybe he was just anxious to go. The engine roared, and the car jerked and bucked, and suddenly we were moving! I heard a shout and looked back. The salesman was running after us, waving his tools and yelling something, but I couldn’t hear what he was trying to tell us because of all the noise . . .
We made a left turn and came to the railroad tracks. Just ahead, a big steam locomotive was coming down the track. Grandfather blew the horn and the engineer blew his whistle. The locomotive was picking up speed and getting closer. Grandfather decided that he had better stop, so he hit the brake pedal. Nothing happened! . . . Now we knew why the salesman had run after us. The brakes didn’t work! . . . Very slowly I opened my eyes and saw that, somehow, we had made it across the tracks. Behind us, the locomotive thundered past . . .
Then I looked at Grandfather, sitting tall and straight behind the wheel, his braids moving in the wind. He was steering straight down the road. His eyes twinkled with pleasure. He was getting used to driving his popping machine. Somehow I wasn’t so afraid any more . . . When the road flattened out, Grandfather sang his wolf song. This was the same song he had sung as a young warrior when he returned to camp with horses taken from the enemy. The big story in the world of photography these days concerns the fiftieth anniversary of a landmark book called The Americans, by Robert Frank. The volume is a set of 83 of Frank's black-and-white shots of the United States in the 1950s, taken on a year-long roadtrip across the country. Most of the photos evoke strong feelings of loneliness and alienation and shallowness ... images that are powerful and insightful, but not necessarily flattering. As a result, Americans were decidedly unappreciative of the book, at least at first. The photos struck a chord with Jack Kerouac, though, who wrote an introduction for the volume and said that Frank “sucked a sad poem right out of America onto film, taking rank among the tragic poets of the world”. 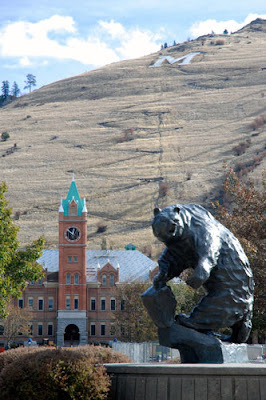 Given the overriding mood of the book, it's not surprising that the four Montana images it contains were taken in Butte. 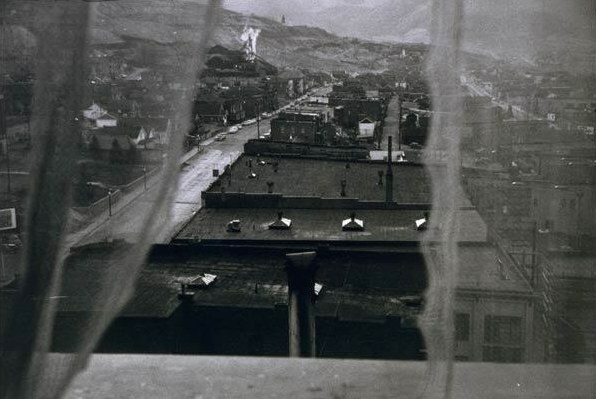 Here's the best known of those: "View from Hotel Window," taken in May 1956. The shot looks eastward from the Finlen Hotel ... and of all the buildings you see here, probably no more than half a dozen still stand today. Today's photo is just a quick follow-up to yesterday's post ... it's a shot I took last summer of the old railway depot in White Sulphur Springs, an abandoned passenger car still sitting beside it after nearly thirty years. Here's another still image from a Montana-made film ... and another railroad shot, since I'm a fan of those. 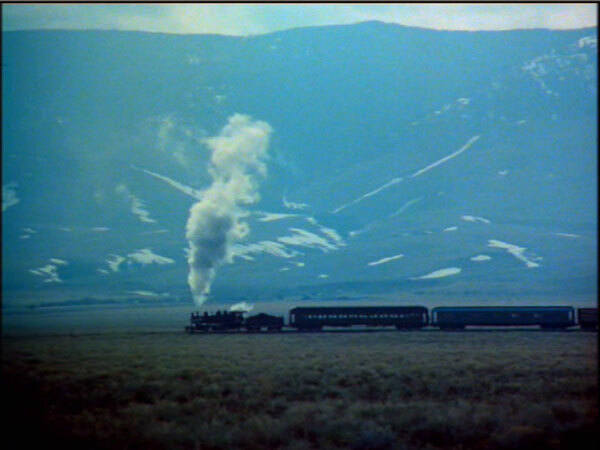 The little train in this wonderful image was running on the White Sulphur Springs & Yellowstone Park Railway, which ran from White Sulphur down to Ringling. (Nope, it never made it to Yellowstone.) By the 1970s the railroad's days were numbered, the freight traffic almost gone. 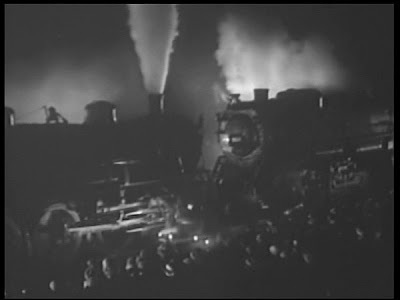 A promoter named "King" Wilson acquired the line, brought in a steam locomotive and some passenger cars, and tried to turn it all into a tourist attraction. It wasn't a success, though, and the railroad closed down after the Milwaukee Road -- its connection to the outside world -- was abandoned in 1980. The Heartland movie shoot was probably the highlight of the little railway's life. From what I can tell, the old locomotive is at a railroad museum in Nebraska these days, though it hasn't run in years. And a few of Willson's old railway cars are still sitting up in White Sulphur, just where he left them back in 1980. I've been lucky enough to be able to spend some time in a number of Montana's smaller towns, getting to know them. Others, though, I've just passed through, maybe stopping for gas or a snack and then moving on. So I only know bits and pieces about a lot of places, and I regret that ... it always makes me want to go exploring all the more. I confess that one of those places I've never gotten to know well enough is Jordan, though I've made a number of cross-state trips through there on Montana 200. But the bits and pieces that we hear about Jordan always seem to be particularly interesting. Many Montanans, unfortunately, still stereotype Garfield County by associating it with the Freemen, the cranky anti-government folks who made such a scene back in the 90s. There's also the oft-stated claim that Jordan is the most isolated county seat in the country, which may well be true, though I don't know how you calculate such things. The historian in me remembers a few other things about Jordan, as well ... like the fact that the state once built a large irrigation dam there, which promptly washed out and flooded half the town. And the fact that the school district there operated the last public school dormitory in the state, something that many eastern Montana high schools once had. Oh, and there's the alleged story about the misadventures of one of Ernest Hemingway's sons in Jordan ... which I'm not going to get into at the moment. All in all, an intriguing place that I'd like to get to know better. I haven't taken a good photo of Jordan yet, but I'll work on that someday. 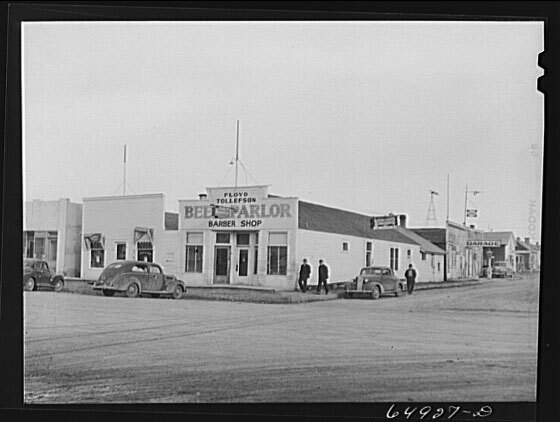 In the meantime, here's a photo of the town taken by a US government photographer back in 1942. There's something very cool about nighttime photos of small-town Main Streets, especially from the age of neon. Here's a cool one of Missoula, probably from an old postcard. This is looking north along Higgins Avenue from the bridge over the Clark Fork River, showing the heart of the commercial district and a a couple of the city's landmark buildings: the great old Wilma Theatre and the Florence Hotel. 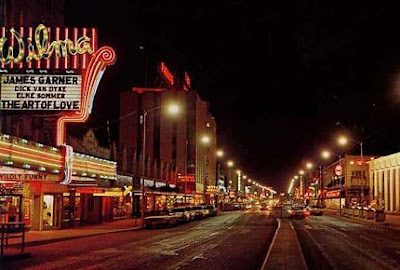 Based on the name of the movie playing at the Wilma, the photo was taken in 1965. This is a photo from the first Thanksgiving I spent in Montana, and the first one away from home. I was in college, and had spent the summer before working at Lake McDonald Lodge before heading out for another year of school. I missed Montana, though ... so instead of spending Thanksgiving at home I drove up to Bozeman to meet a friend of mine from the park, and then we headed up to Lake McDonald to camp in the snow. A friend in Lakeside took pity on us and invited us to Thanksgiving dinner, and we skied up the Going-to-the-Sun road for a ways and basically froze to death. It was a great time. 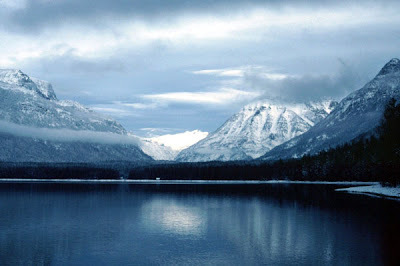 I was probably standing on the boat dock at Lake McDonald Lodge when I took this shot, looking up through the mountains towards the Garden Wall. Today's quote is a memory of an early Thanksgiving day in the gold rush town of Bannack from the diaries of Harriet Sanders. Harriet came to Montana in the summer of 1863 with her husband, Wilbur Fisk Sanders, a man who became one of Montana's most prominent attorneys and civic leaders. (Wilbur is best remembered for his role as a leader in the territory's famous vigilante movement of the era ... which makes the following quote all the more interesting.) Forty dollars in gold was a hefty price back then. Hope you all have a good Thanksgiving. As far as search engines go, I'm a definite fan of Google ... particularly Google Books, which as you might guess is an invaluable tool when doing a blog like this. It seems like you can find pretty much anything there. 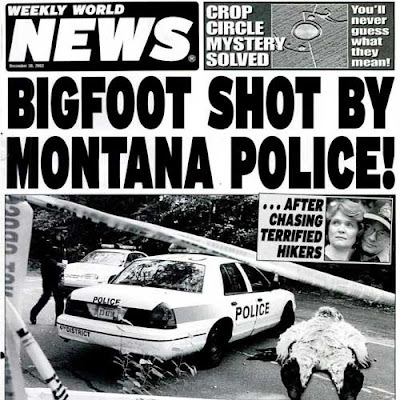 Including, for example, the complete press run of the Weekly World News! I know you're wondering why anyone would want to have access to something like that ... but there are times when you just might be in the mood for a little badly-written, pop culture fiction. Undoubtedly, the best-known Native American quote that's associated with Montana is Chief Joseph's famous "I will fight no more, forever" speech, given at the Bear Paw Battlefield in 1877. But my favorite is another well-known one, part of which is excerpted below. Though stories of its origin vary just a bit, it was reportedly given about 1833 by a Crow Chief named Eelápuash (also spelled Arapooish), and recorded in the journals of a man named Benjamin L.E. Bonneville. The journals were later edited and published by the noted author and essayist Washington Irving. The Crow Country is a good country. The Great Spirit has put it exactly in the right place; while you are in it you fare well; whenever you go out of it, whichever way you travel, you will fare worse. . . . The Crow Country is exactly in the right place. 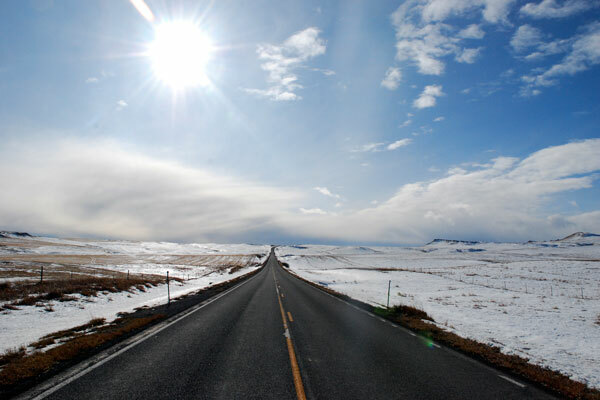 It has snowy mountains and sunny plains; all kinds of climates and good things for every season. When the summer heats scorch the prairies, you can draw up under the mountains, where the air is sweet and cool, the grass fresh, and the bright streams come tumbling out of the snow banks. There you can hunt the elk, the deer, and the antelope, when their skins are fit for dressing; there you will find plenty of white bears and mountain sheep. In the autumn, when your horses are fat and strong from the mountain pastures, you can go down into the plains and hunt the buffalo, or trap beaver on the streams. And when winter comes on, you can take shelter in the woody bottoms along the rivers; there you will find buffalo meat for yourselves, and cottonwood bark for your horses . . . . The Crow Country is exactly in the right place. Everything good is to be found there. There is no country like the Crow Country. 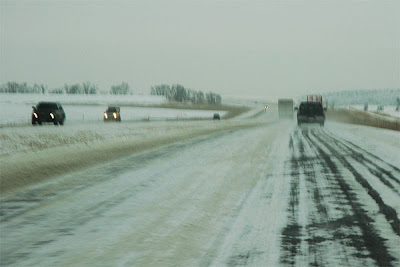 Though I'm a true fan of long Montana drives, I'll confess to slightly mixed emotions about doing it in the winter. There's the whole snow thing, of course, and the ridiculously short days, and the frigid north wind that seems to appear every time you stop for a bathroom break. But there are real joys, too, that you just don't experience in the summertime. There are fewer tourists, and the winter light makes for great photographs, and the snow itself is often really lovely. Here's a photo I took on Saturday to illustrate some of that. This is US 191, somewhere between Big Timber and Harlowton. I made another drive up to the Judith Basin yesterday morning, a striking and typically-gorgeous late-autumn Montana day. My destination was the town of Denton, where the undefeated Trojans were hosting the state six-man championship high school football game. Their opponents were the Roy-Winifred Outlaws, a newly-formed co-op team from two small schools an hour or so away. The Denton and Winifred teams have been rivals for decades, and so it promised to be a fun afternoon ... and it was. Driving into Denton on the road that the Winifred fans would have used, I saw that Denton had tied streamers with their school's blue-and-white colors to the roadside reflector poles ... for miles. Out by the Judith, they'd hauled a bunch of huge circular hay bales to the roadside and spray-painted "Go Blue" onto them. Not to be outdone, Winifred and Roy had made an even bigger hay-bale sign nearby reading "Go Outlaws." When I arrived at the little field it was clear that most of the population of all three towns was there. Denton helped accommodate the overflow by providing temporary bleachers made of hay bales atop flatbed trailers. I had a fine time, talking to a few of the locals, lunching on a cheeseburger, and taking lots of photos. Got to meet the author of the Small Town Football blog, as well. And I watched the game, which in typical six-man fashion was lots of fun. But it wasn't a cliffhanger. Though the Denton folks had all expected to win, the team never really managed to get going, and the Outlaws scored the first points and never looked back. 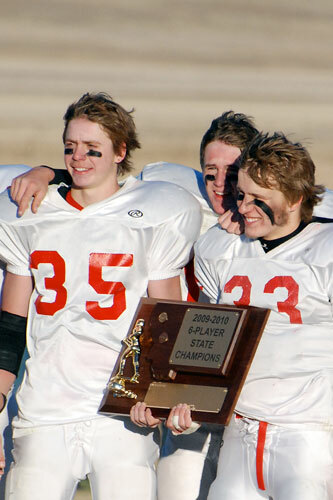 In the end the score was 53-20, nearly a blowout -- and the Outlaws were the new state champions. There was a little awards ceremony and then everyone streamed onto the field for hugs and high-fives and photographs. It was a great moment, and the Outlaws deserve lots of accolades. They handily beat all three of the state's undefeated six-man teams in their playoff run -- a pretty amazing feat, indeed. This is one of my favorite photos from the last couple of weeks ... I shot it a few miles southwest of Utica, on the road heading up the Judith River towards the sapphire country. 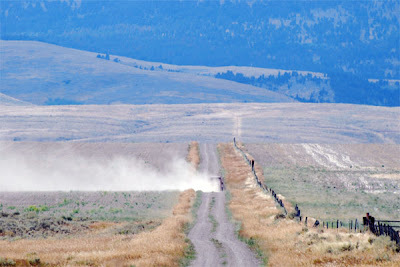 Everyone who explores Montana knows scenes like this, and to me it's a quintessential part of the state. 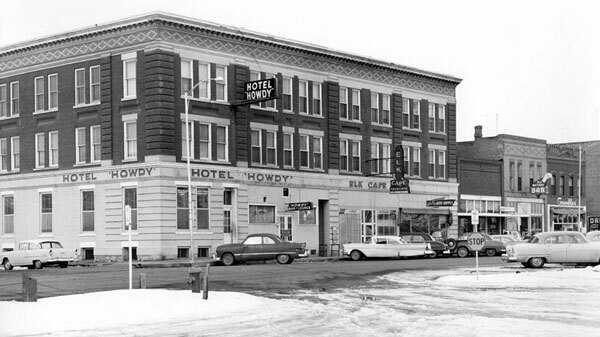 Today's photo is another one from Mike Blakesley in Forsyth ... it's a 1961 shot of what is undoubtedly the best-named hostelry in Montana: the Howdy Hotel. This handsome building has been a downtown Forsyth landmark for over a century now. It's the sort of hotel that nearly all Montana towns would have had a couple of generations ago, but that mostly closed with the advent of freeways and chain motels. Happily, though, the Howdy is still going strong. Most of the rooms are rented out to long-term tenants these days, but there's still space for overnight guests. And in the room next to the lobby you'll find the Speedway Diner, absolutely the place to get something greasy to eat in the middle of the night. Though I love most Montana towns, I'll confess to a real soft spot for Forsyth. I spent several months there a number of years ago, doing my first big history project, and I still feel a real connection with the place ... though the town has changed some, of course, and many of the people I knew in Forsyth have since passed away. My friend Mike Blakesley is still there, though, running the gorgeous old Roxy Theatre, and a few days ago he very kindly sent me a number of historic photos of the town. This is one of my favorites -- it was taken by Mike's father Bruce, at the Forsyth Horse Show parade back in the 1950s. 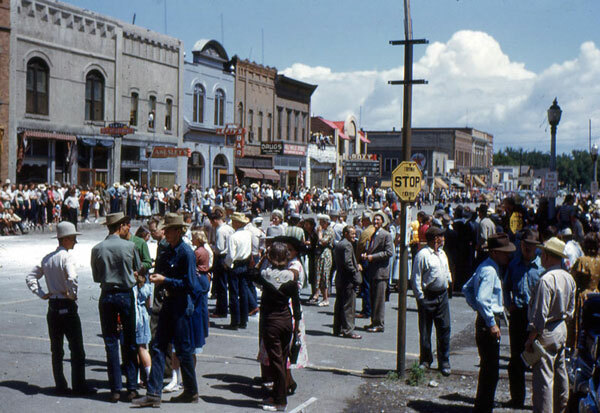 I love it for all the period details you can see ... the old-style stop sign, the clothing styles and the cowboy hats, the building cornices and facades that are now mostly hidden. And the old signs! Blakesley's Cigar Store, Lefty's Bar, and of course the Roxy ... it's the survivor on that street, and today looks better than ever. The clouds and sky in yesterday's photograph inspired a brief discussion afterwards, about how Charlie Russell managed to so perfectly capture those Montana skies in his paintings. A good online friend mentioned that Ian Tyson had once written a song that mentioned that very fact, so I went looking for the thing ... and here it is. Ian Tyson is a country singer and songwriter, an artist with near-legendary status in his native Canada. Most Americans (including me) know of him mainly because of his song "Four Strong Winds," which has been covered by Neil Young and a host of others. (Personally, I recommend the Judy Collins version.) But Tyson's discography is much broader, and includes several lyrics with Montana themes. When I sat down this morning I realized I was about to make my 200th post in this blog ... who would have thought? Not me. Anyhow, since the open road has been such a big part of this journal so far, I thought another highway picture would be a proper commemoration. Here's a shot I took several days ago, driving through the upper Madison Valley just before sunset. I'm finding that small-town football games are great excuses for long roadtrips ... and so yesterday I drove all the way out to Hysham to watch one of the semifinal games in the state 6-man tournament. The Hysham Pirates were the host team ... they've been a powerhouse for years, and came into the game at 10-0, regarded by many as the best 6-man team in the state. This is a photo I took of their opponents, the Outlaws ... a co-op team of kids from the tiny high schools in Winifred and Roy. They came in second in their division but are a tough bunch, and managed to topple the previously-unbeaten Big Sandy Pioneers the week before. But the Outlaws had lost to Hysham back in September. It was a beautiful but chilly day, and it seemed like a good chunk of small-town Montana was there. The little concession stand did a brisk business selling hot chocolate, and "lunches" that featured bowls of chili along with insanely-large homemade cinnamon rolls. The crowd was rowdy, and pirate flags waved proudly from the top of the tiny bleachers. And the unthinkable happened, at least from Hysham's perspective. Winifred/Roy started out with two fast, unanswered touchdowns ... and they never looked back, cruising to an effortless 52-34 win. Next week the Outlaws play Denton for the state championship. The two teams are neighbors and long-time rivals, so it's likely to be a heck of an afternoon. I just might have to drive up. Years ago, I was doing historic research at an archive out in Milwaukee, and I came across an architect's sketch for a proposed railway depot in the little town of Musselshell ... which is a ways east of Roundup, in case you're wondering. I thought it was a gorgeous little building, and so I made a photocopy of the drawing, and tried to find out more about the thing. But there wasn't much to be found. 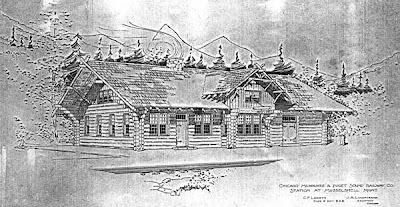 I saw an old photo proving that the station had indeed been built, and I learned that the architect had also done the landmark Milwaukee depots in Missoula and Great Falls ... but that was it, either about the building or the designer. 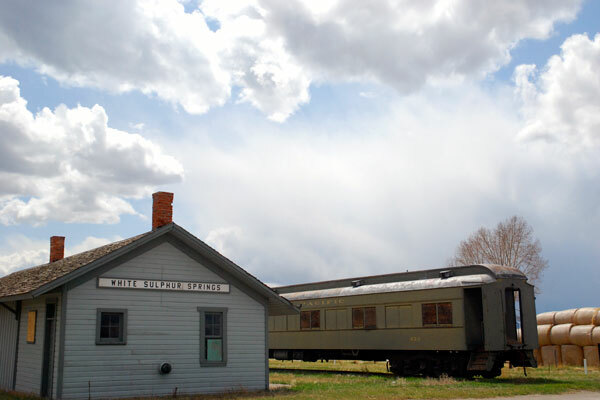 Nearly always, small Montana towns like Musselshell used to get simple, standardized depot buildings, designs that were replicated dozens of times across a railroad system. Why did Musselshell, of all places, merit something this unique and cool? A pointless question, I know, and I'll never find the answer ... but I still wonder about it. There's no doubt (at least to me) that maps provide the greatest recreational reading imaginable. And old maps can be particularly fascinating, both for their period graphics and because they provide fascinating insights on how the human landscapes of the world are changing. So I'm scheduled to give a presentation on the Going-to-the-Sun Road at the Montana Historical Society in Helena tonight ... and somehow Mother Nature must have found out about my upcoming drive, because there's nearly a foot of new snow in my yard this morning. The joys of living in Montana! Here's a photo to mark this combination of events. 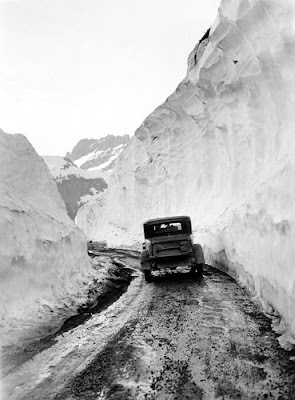 This is an early 1930s shot of a car passing through the "Big Drift" on the Going-to-the-Sun Road. The Big Drift is just east of Logan Pass, and is often the last obstacle cleared by the plows before the road opens each summer. I was wandering around up in the Judith Basin country last weekend, and I took this photo of the old St. Wenceslas Catholic Church in Danvers. Danvers is an evocative but dying little town on the old Milwaukee Road line between Lewistown and Denton ... just a couple of grain elevators, a handful of houses, and the church. There was a really handsome old schoolhouse there, too ... at least until earlier this year, when some evil, heartless person tore it down. It's been a long time since St. Wenceslas has seen more than occasional use, and now I hear that the local diocese (true to form) wants to tear it down, too ... this despite strong local sentiment to save it. I'm betting the diocese gets its way, and that the next time I visit Danvers there will be one less landmark on the prairie. Breaks my heart. I paid a quick visit to Red Rock Lakes National Wildlife Refuge a few days ago, making the long, dirt-road drive from Monida and then over the pass to Henry's Lake in Idaho. It was a blustery autumn afternoon, and it was easy to see that it wouldn't be long until the place was snowed in for the winter. But it was gorgeous. 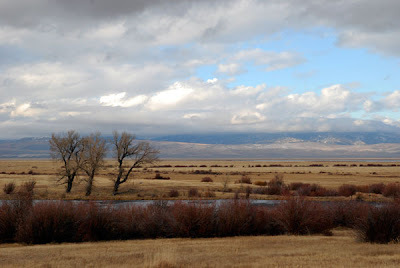 The refuge is in the high Centennial Valley, just north of the Idaho line in Beaverhead County. 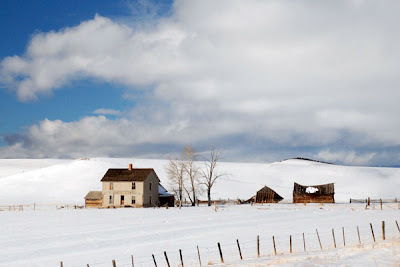 The valley was once a primary route for stagecoach travelers headed to Yellowstone, and homesteaders later settled there, but hardly anyone lives in the valley anymore ... it's too remote and the winters are too long. Much of the valley floor is used as summer range for cattle, while the Refuge occupies the eastern end. It was established in 1935 to protect habitat for migratory birds, and was a key part of the effort to save the Trumpeter Swan from extinction. Beautiful country, and well worth a visit. As promised (or threatened) yesterday, here are a couple of key paragraphs from the infamous "Buffalo Commons" article by Frank and Deborah Popper. It's easy to see how inflammatory this was. Looking at it, though, it's pretty clear to me that the Poppers' predictions aren't likely to come true ... and that, on a broad scale, at least, they probably shouldn't. Still, the article points out that there are issues that we as Montanans will certainly have to face. For me, the biggest one is the changing cultural landscape of the northern plains -- many of the towns are dying, and it's harder and harder to keep young people from leaving. At the same time, farms and ranches continue to consolidate, and more and more of them become corporate rather than family endeavors. Someone needs to figure out how to solve those problems, or the culture of the northern plains as we know it will cease to exist someday ... and that will be terribly sad. We believe that despite history's warnings and environmentalists' proposals, much of the Plains will inexorably suffer near-total desertion over the next generation. It will come slowly to most places, quickly to some; parts of Montana, New Mexico, South Dakota, and Texas, especially those away from the interstates, strike us as likely candidates for rapid depopulation. The overall desertion will largely run its course. At that point, the only way to keep the Plains from turning into an utter wasteland, an American Empty Quarter, will be for the federal government to step in and buy the land -- in short, to deprivatize it. The federal government's commanding task on the Plains for the next century will be to recreate the nineteenth century, to reestablish what we would call the Buffalo Commons. More and more previously private land will be acquired to form the commons. In many areas, the distinctions between the present national parks, grasslands, grazing lands, wildlife refuges, forests, Indian lands, and their state counterparts will largely dissolve. The small cities of the Plains will amount to urban islands in a shortgrass sea. The Buffalo Commons will become the world's largest historic preservation project, the ultimate national park. Most of the Great Plains will become what all of the United States once was -- a vast land mass, largely empty and unexploited. At an academic conference in Missoula back in 1987, a man named Robert Scott presented a paper that inaugurated a controversy that's still simmering. The paper, titled "Saving the Big Open: The Case for a Great Plains Wildlife Range," proposed intentionally depopulating much of eastern Montana and turning it into a wildlife preserve called the Big Open. 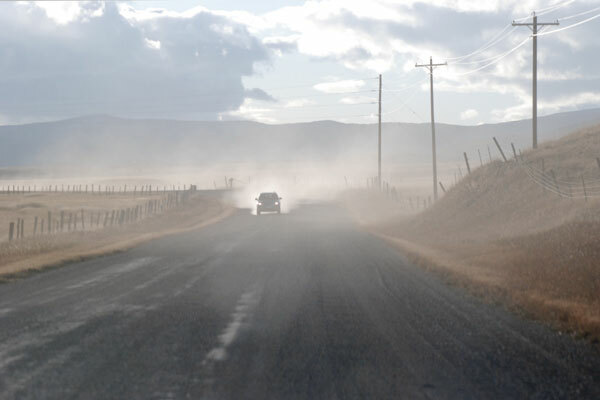 The notion garnered more attention that fall when Frank and Deborah Popper published an article called "The Great Plains: From Dust to Dust," that expanded the idea to other states while announcing that the depopulation was inevitable. In the piece, the Poppers stated that the initial settlement of the area was the "largest, longest-running agricultural and environmental miscalculation in American history." It was, of course, a difficult statement for many to hear. I had (and still have) mixed thoughts about it all, because I love exploring that country and its towns and its cultural landscape ... but at the same time, I know that I'm watching much of it fade away forever. If I were in charge of tackling the issue, I honestly have no idea what I'd do. I'll post a more detailed quote from the Poppers' proposal tomorrow, but for today here's a paragraph from the beginning of the piece -- a description of the Plains as planners see it. The Great Plains are America's steppes. They have the nation's hottest summers and coldest winters, greatest temperature swings, worst hail and locusts and range fires, fiercest droughts and blizzards, and therefore its shortest growing season. 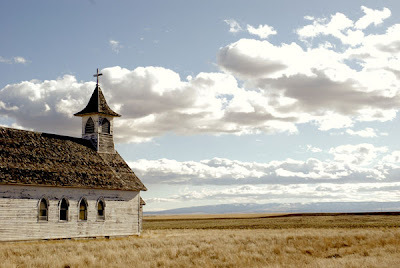 The Plains are the land of the Big Sky and the Dust Bowl, one-room schoolhouses and settler homesteads, straight-line interstates and custom combines, prairie dogs and antelope and buffalo. The oceans-of-grass vistas of the Plains offer enormous horizons, billowy clouds, and somber-serene beauty. Last night was an absolutely stellar Montana evening. 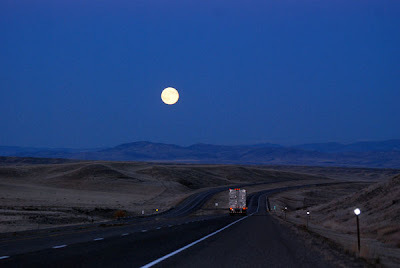 Driving east towards Bozeman a little after dark, I marveled at a clear, deep-blue sky and a huge moon, not quite full, rising over the Bridgers. It was gorgeous, and made the whole day worthwhile. I didn't stop to take a photo, but the evening reminded me of a very similar one when I did, almost exactly two years ago. Here's the shot I took in 2007 ... I was near the top of Cottonwood Hill, a little east of Cardwell. I bet most of you didn't even know that Montana has an official poet laureate! We've had three of them, in fact ... the title was created in 2005, and recipients hold the position for two-year terms. Today I had a letter from France. on the caving bank of the Bitterroot. A shadow slips through the silver grasses. I'm a summer person, without a doubt ... but there's also no doubt that this is a fine time of year in Montana. The winter light makes for striking photographs, and the snowy mountains can be extraordinarily evocative. And of course the sky is as big as ever. 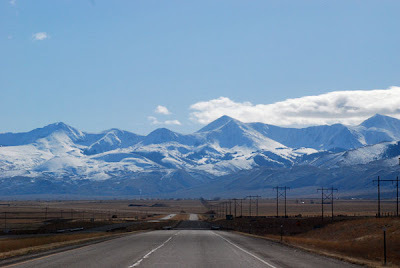 Here's a shot I took last Saturday, driving south through Beaverhead County. Those are the Centennial Mountains in the distance. I promise you all that this is absolutely NOT going to turn into a sports blog ... but I have one more football photo for you. 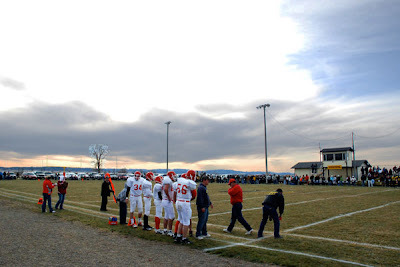 I ended up in the small town of Lima last Saturday afternoon, and watched one of the playoff games for the state 6-man high school football championship. The game pitted a plucky co-op team from the little towns of Reed Point and Rapelje against an evil squad from Dubois, Idaho. I was looking through a little anthology recently called, The Arts in Montana, and found an essay titled "The Trouble with Town Names." The piece spent a couple of pages pondering Montana's preferences in that department ... and though I didn't really agree with the author's thoughts it gave me an excuse to consider what my favorite town name in Montana might be. It's hard to think of an image more evocative of rural Montana than that of a lonely pickup truck, heading out along an empty dirt road through the rangeland. I took this shot a little over a year ago, on the road that heads west from Ringling towards Battle Creek and the old town of Sixteen. The trails are old wagon roads which get down to the river somehow -- twisting along an old water course or plunging wildly down an extended buttress of a long butte. 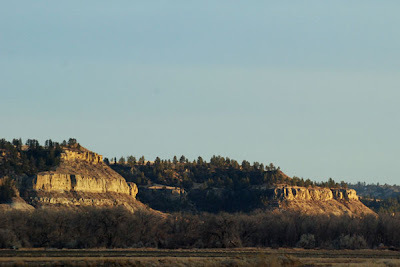 Scrub pine, spruce, and cedar are scattered in the purple-shadowed coulees and on the hundreds of isolated hills which start up suddenly from the vast canyon floor; the sun, soon gone, rekindles briefly the centuries-old color in pre-glacial cliffs, and a distant mountain range turns violet, then black, against the blue-green sky. I confess I'm not much of a fan of college or pro sports. I haven't been to an MSU football game since before a few of you were born, and when people mention the legendary Montana State-University of Montana sports rivalry I invariably just roll my eyes and snort, "It's only a game." But despite all that, I went to a football game on Saturday. 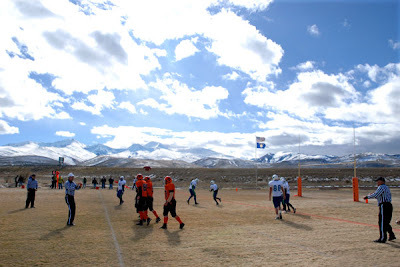 Montana's still a heavily rural state, and close to half of Montana's high schools don't have enough students to field traditional football teams. Many of the smaller schools play in eight-man leagues, but the 28 littlest schools play something called six-man football, which is a very different sport. The field is only 80 yards long, it takes 15 yards to get a first down, and absolutely everyone is eligible to receive a pass. So the games are fast-moving, unpredictable, and a heck of a lot of fun. 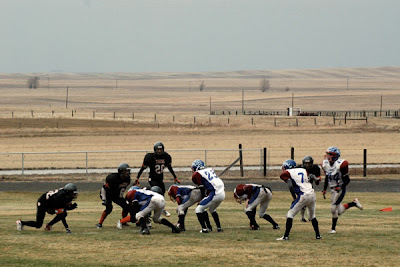 To sample six-man football I drove up to Geraldine, where the Tigers were hosting a co-op team from Richey and Lambert. 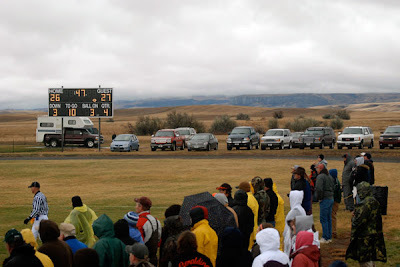 (The tiniest Montana schools will often bond together to field athletic teams -- otherwise they'd have no interscholastic sports at all.) It's 321 miles from Lambert to Geraldine, and the two schools sent a team of six starters and two reserves. Geraldine has a strong history of six-man football, and they had 13 players suited up ... not bad for a school with a total of only three dozen students. The weather was utterly frigid, and I think I was the only out-of-towner there. And the game was a blast: constant motion and lots of excitement, the total opposite of the orchestrated military maneuvers you see in major-college ball. The ending was pure adrenaline, with a missed extra point, a successful onside kick, and a dropped pass reception that would have changed everything. When it was over, the favored Tigers had lost a 27-26 heartbreaker ... but the Richey/Lambert boys had something to celebrate on that long drive home. I'm now a serious fan of six-man football, and I can't wait to go to another game. The playoffs start next weekend, and Geraldine is heading out to play the undefeated Hysham Pirates. It would be fun to watch, but I'm afraid the Tigers are going to get their butts kicked.